Physics Buzz: Sometimes Even Scientists Have to Just Say "Huh?" Some days Scientists just have to throw up their hands and admit that they just don’t know why something is happening the way it is. I love it when this happens, not because I like seeing exasperated physicists (though it can be pretty funny sometimes), but because it shows that there's still so much left in the universe to discover. That's what happened this week when scientists from the Argonne National Laboratory announced that they really just don’t know why certain metals can transfer electricity without resistance at relatively high temperatures. They’ve got some guesses sure, but right now that's all. When one freezes most materials down to super-cold temperatures (within a tiny fraction of a degree above absolute zero) a strange phenomenon sets in. Magnetic fields stop going through the object and electrical current is able to flow without any of resistance. 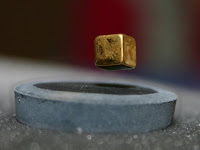 This is called superconductivity, and even with these near zero temperatures, it's a hot field for study in physics. Because superconductors don't have any resistance, electrical charge is able to flow through them without losing any energy. This could in the future be used to transfer electricity vast distances without losing any power. In addition the electrical current can even keep flowing after the original voltage is removed, much like an ice skater can keep moving just from their own momentum. Getting materials to keep these unusual properties at warmer temperatures has been a huge focus for scientists. They've been able to get certain copper based materials to hold on to their superconductivity in temperatures as high as 77 degrees Kelvin (that's a balmy -196 degrees Celsius). However last year scientists were able to get certain iron-arsenic compounds to hold onto their conductivity up to 55 K. Now they’re just not sure why. In the copper compounds, small vibrations in the superconductor's molecular structure let electrons pair up and travel freely through the material. However tests have shown that the vibrations in the iron-arsenic compounds just aren't strong enough to let that happen, leading to speculation that maybe it's the material’s magnetic properties that cause the superconductivity. As of right now, no one is really sure. That's what makes all of the cutting edge research so exciting, because who knows what new and exciting discoveries await around the next corner. I suspected that it was on individual factors that decided the element's conductive abilities, as I am trying to prove in my theory.